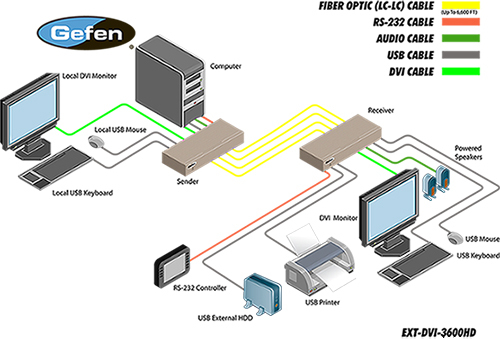 The DVI 3600HD allows you to operate a single DVI-compliant computer from two workstations, by extending DVI, USB 2.0, analog audio, and RS-232 from the computer to the remote workstation. 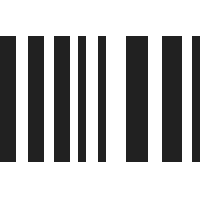 USB peripherals can be placed at either of the two locations, by the Sender or Receiver unit. The DVI 3600HD consists of a Sender and a Receiver unit. The Sender unit connects to the computer's DVI-compliant video card output, analog audio jack, RS-232 port, and USB 2.0 port. The DVI 3600HD Receiver unit connects to the remote display and peripherals. Four strands of LC fiber optic cable connect the Sender and Receiver units together. The DVI 3600HD has two modes of USB operation. When in local mode, the computer sees USB devices connected to the Sender unit. When in remote mode, the computer sees USB devices connected to the Receiver unit. These two modes are configured using a switch on the front panel of the Sender unit. Question: DVI3600HD Spec sheet states - "Supports Virtual DDC1 and DDC2B protocols". The previous model, DVI3500 spec sheet states - "Supports Virtual DDC and DDC2B". Can you please shed some insight on why these two identical features are not documentation the same on the Spec sheets? Both devices support DDC1 and DDC2B - the newer spec sheet most likely made the specification of "DDC1" as opposed to just "DDC" as DDC in general can also just mean the whole suite of standards including DDC1, DDC2B, DDC/CI, E-DDC, etc. Here is a simple breakdown for differences between DDC protocols.